Twitch announced that it would be getting into video game and related content sales back in February. There have been reports that it would begin selling games today, but the date seems to have changed to a less precise later this week. TechCrunch says "the exact timing is still in flux". Amazon bought Twitch back in August 2014 in a surprise win following murmurs that Google was negotiating to snap up the site. As a social video platform for gamers it's natural that Amazon would seek to monetise it further by simply selling games through this channel, and now it seems to be on the brink of doing so. To start with, Twitch will sell a rather limited range of games and in-game content. Reports say that it will be limited to about 50 AAA titles - but they will be popular current titles such as For Honor, Tom Clancy's Ghost Recon: Wildlands, The Walking Dead, Minecraft: Story Mode, Paladins, Warframe, and more. Games will roll out to become more numerous as the retail service matures. Games won't be sold in a traditional store but via developer and official partner streams / pages (see image above). Developers earn 70 per cent of the take, while partners can earn 5 per cent from sales. It would be possible for a successful streamer to "make a living doing what they love," reckons Twitch. 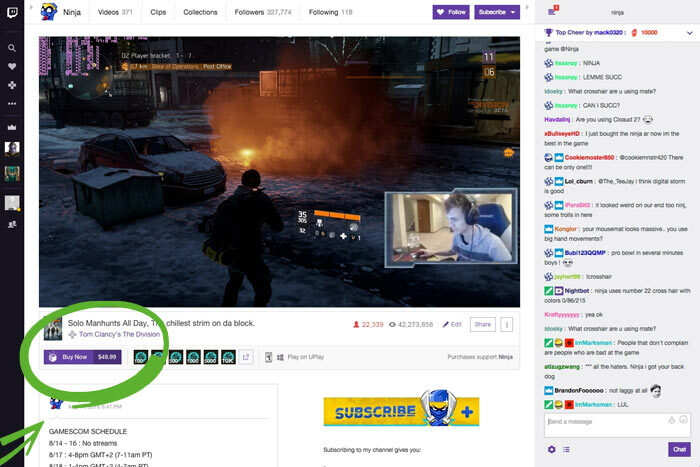 It is hoped that monetary enticements won't change the Twitch social video platform in a bad way. In comparison to other avenues for acquiring games, Twitch hopes you would buy through its site to support the streamers and every $4.99 or more spent earns a Twitch Crate, offering randomised item drops. Such crates can include unique emojis, chat badges and other usually chargeable items. For the coming month Twitch is adding four weekly prize draws for purchasers. Twitch enjoys 9.7 million daily active users. But it totally makes sense for them to sell games from there as they are part of amazon.